I found this and thought i would share on how to fix the problem. The constant jostling and the weight of a roof top air conditioner can take its toll on many older RVs. 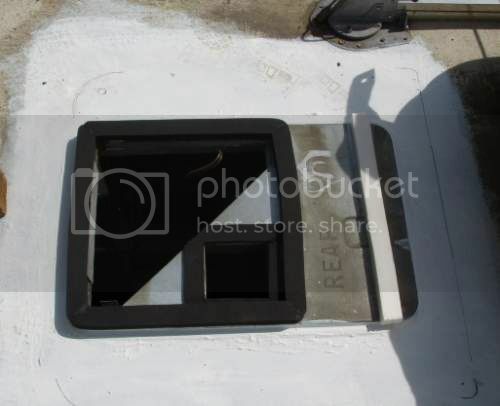 It is quite common to find the roof area around the air conditioner sunken or sagging, especially on those RVs with "soft" roof construction. The typical result is a good-sized pool of water around the unit that often culminates in water leaking into the roof area. It will first be necessary to determine the rafter spacing. On most soft roofs the rafter positions are very evident. Measure the distance between the centers of each rafter. It will usually be either 16 or 24 inches. Next, completely remove the air conditioner. Uhh, be sure all the electricity is properly turned off and locked out first! Keep in mind, the rubber seal will, in all likelihood, be ruined when removing the unit, so be sure to have a replacement on hand before starting. TAKE CARE when lifting the unit off the roof. Old sealants may cause the unit to stick to the roofing material often creating tears in the metal. 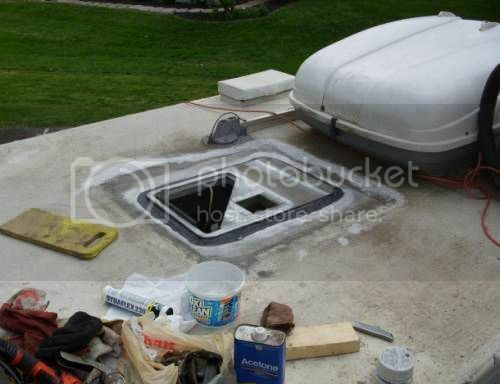 Be sure to clean off the old gasket and any sealant from around the 14-inch opening and remove any staples through the roofing material around the opening. Next, cut a piece of 3/4-inch plywood -- 28 inches wide by however long is necessary to span two adjacent rafters. Usually there is one rafter fairly close to the opening and another, 16 or 24 inches away. Position the plywood flat on the roof, centered directly over the opening, making sure it straddles one rafter in front of the opening and one rafter aft of the opening. Next, from inside the RV, mark around the opening. Cut and remove that 14-inch square opening out of the plywood. You will now have approximately a 28" X 34" piece of plywood with an approximate 14-inch square cutout somewhere in the middle. 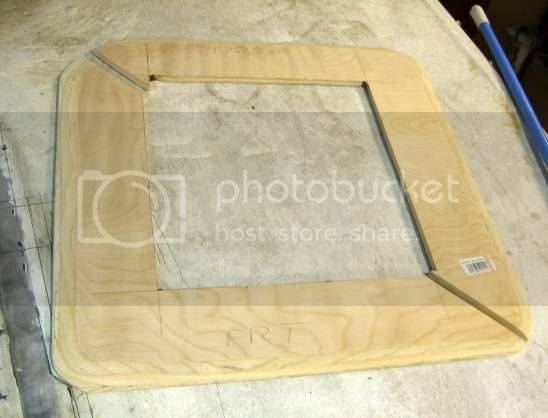 Now, mark and cut the plywood in half longitudinally down a center line resulting in two, 14" X 34" pieces of plywood with a "U" shaped opening in each piece. Insert each piece into the roof cavity through the 14-inch hole, underneath the sheet metal yet on top of the existing rafters. Slide each piece into position on either side of the 14" opening taking care not to disrupt the roof insulation in the process. After both pieces are in position under the metal roof and on top of the rafters, secure the roof metal to the reinforcement material around the 14-inch opening only. Next, apply new sealant and a new gasket, and then reinstall the air conditioner. 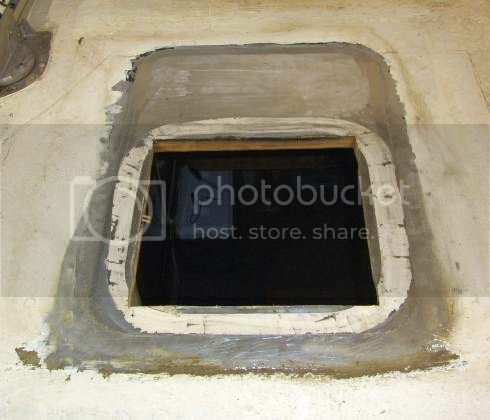 This repair will not only effectively raise that sunken mounting position, but will also provide a much better supporting foundation for the weight of the air conditioner and possibly eliminate future water leaks. 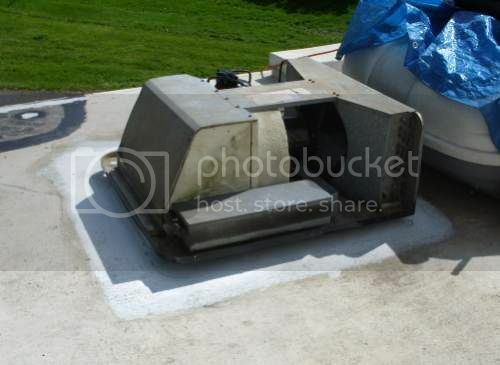 What an excellent, inexpensive way to create a raised area at the roof air conditioner location! This wouldn't even be very time consuming, just a few hours! Re: Shoring up sagging roof due to air conditioner weight! I installed a brand new Coleman Mach a few months ago, and the inside leak was driving me crazy! Turns out the new units are made for a significantly domed roof. Mine isn't as flat as a classic Winnie, but its still not a high dome, and additionally, my roof is a wierd mix of soft and hard. HR didn't use thick plywood or wood rafters or stringers. The whole superstucture, framing and all, is welded aluminum, and the cross section is not thermopanel-like at all. Its thin plywood and foam and aluminum skin panels, sandwiching an almost houselike insulation. What this means is that I have, for all practical purposes, as flat a roof as any old Winnie when it comes to the new Mach. To compress the gasket means the roof compresses a little bit with it. And the new Machs only have 2 drain holes for the condensor drip pan. With very tiny little openings. 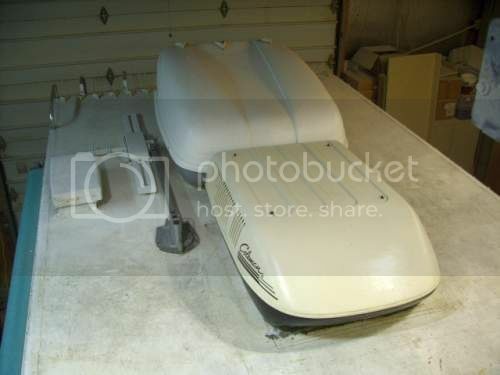 And they close tightly shut against the roof when you tighten the gasket down to recommended specs! The solution? I cut them at more of an angle (with a Dremel), and added plastic wedges next to them to keep them off the roof. They still clog once in a while, but I can now reach them with a pipecleaner and clear them when I notice any inside drips, and it solves the problem.